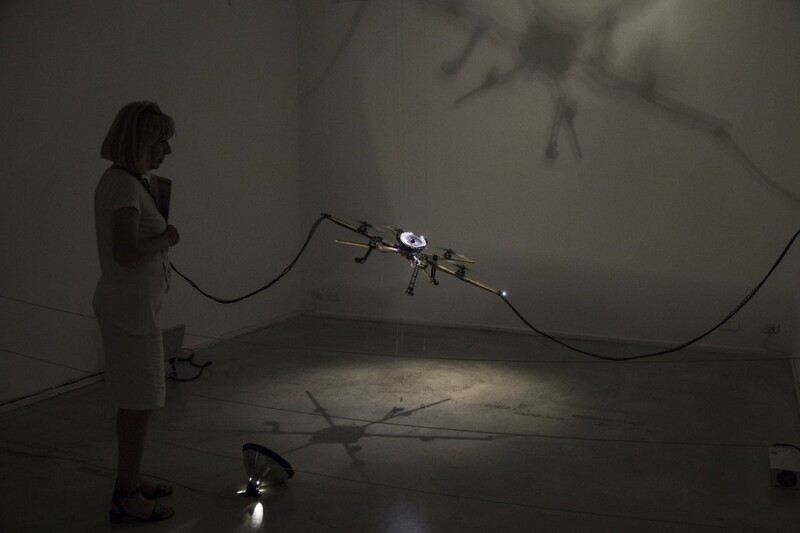 Ophan is an installation incorporating a physically restrained, customized hexacopter as a mechanized cantor, flying and reciting all 28 verses of chapter 1 from the biblical book of Ezekiel. 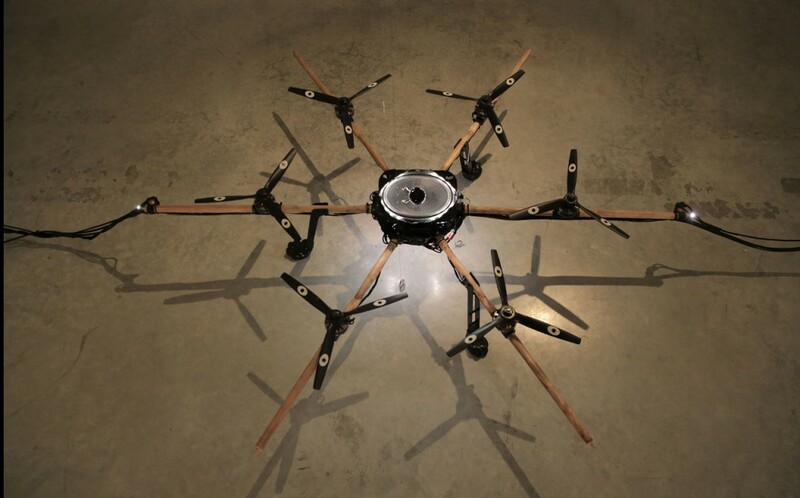 When Ophan is at rest, with no people present at the center of the space, the hexacopter softly hums, whispers, or even sings to itself (its favorite song is “Someone to Watch Over Me”). 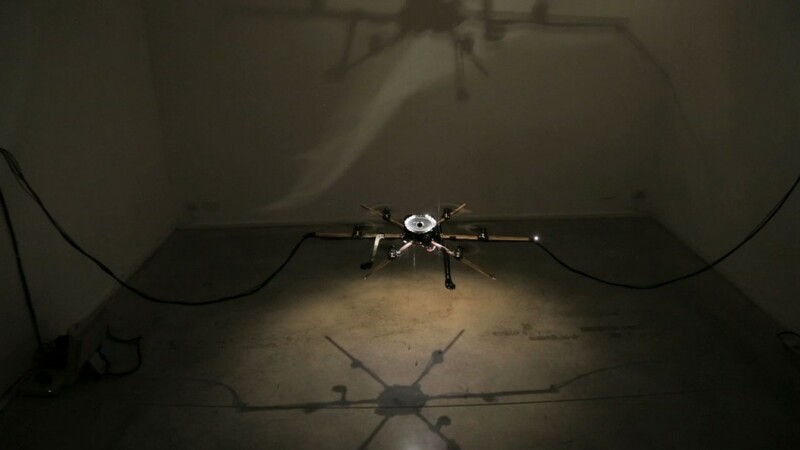 When a presence is detected in the space, the hexacopter’s rotors turn on and it takes flight, struggling against the cables that restrain it, singing and gesturing its way through all the biblical verses mentioned above, as sung in Hebrew in the Yemenite tradition by the Cantor Dan Jacobi. The Yemenite style of Cantorial singing­chanting (cantillation) is monotonous – that is, there is no melody, rather a droning recitation similar to other eastern musical traditions. 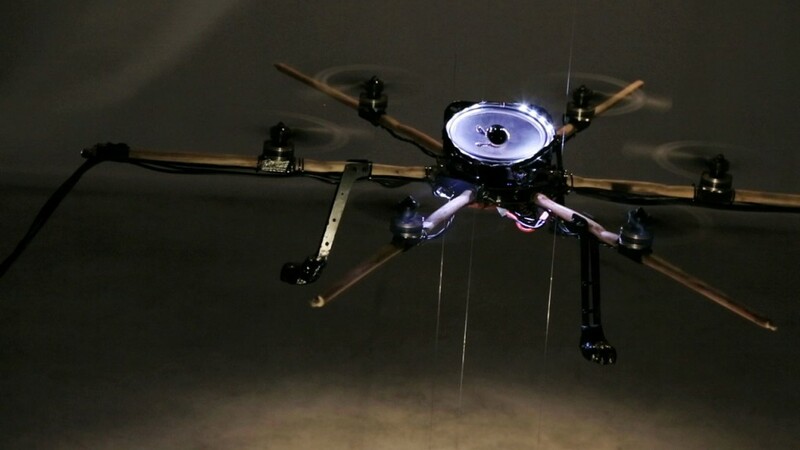 The cantor who recorded the verses for Ophan tuned his voice to the pitch of the buzzing generated by the hexacopter’s rotors, so that they create a harmonized droning sound when combined. At random intervals during the flight, Ophan’s chanting is interrupted by a live broadcast of the Israeli Defense Force radio station (Galei Zahal). When the broadcast takes over, Ophan’s gestures change as well, it wildly flashes its lights and enters a semi­epileptic seizure. Ophan is in the air only for a short while, and thus takes many flights to finish reciting the entire chapter as it usually manages only 3­4 verses before landing again. Ezekiel 1 is one of the main roots for a branch of Jewish Mysticism called “Merkabah mysticism”. This name refers to the esoteric tradition concerned with achieving visions of the chariot of god and it’s component angels, usually via a shamanic out­of­body experience. The installation is named after one of these angels in particular – the “Ophan” (a spoked wheel in hebrew). The Ophan as described by Ezekiel is essentially a mechanical being, a flying entity that is a wheel within a wheel, both of whose rims are covered with eyes. It is remotely driven by the spirit of an anthropomorphic angel, the Cherubim, that is “within it”. 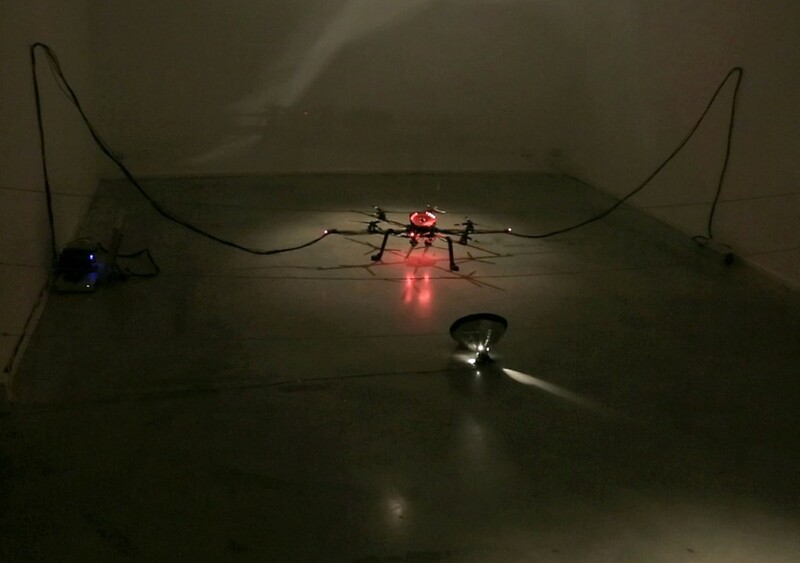 Nadav Assor creates videos, installations, performances, and objects. His work deals with the performed mediation of cities, bodies and personal narratives via appropriated military-industrial technologies. Assor has exhibited internationally in festivals, music venues, museums and galleries in North America, Israel, Europe and Asia. He has recently exhibited and performed work at Residency Unlimited in NYC, the Koffler Center in Toronto, the 2014 Transmediale in Berlin, Julie M Gallery Tel Aviv, the 2013 Berlin Director’s Lounge, the Soundwave Biennial in San Francisco, and Hyde Park Art Center in Chicago. Nadav was born in the US and grew up in Israel, where he earned his Bachelors from the Midrashsa College of Art. He holds an MFA as a Full Merit Fellow in Art & Technology from the School of the Art Institute of Chicago (2010). He is the inaugural recepient of the SAIC Edes Award, and also among the 2011 awardess of the Israeli Ministry of Culture’s Young Artist awards. Since 2012, Nadav has been an Assistant Professor of Expanded Media and a Fellow at the Ammerman Center for Art & Technology in Connecticut College.